The GBD is is devised and managed by Livetech a North Wales based web design and marketing company established in 2000. Having been in business for over ten years and during that time having worked with hundreds of other small businesses we know what a valuable contribution is made to the nations economy and well being by these business owners and operators. 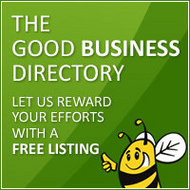 The Good Business Directory is our way of rewarding this great work and an opportunity to give back for the help we have recieved from others over the years. We believe in good value for money and the benefits of helping others, we don’t believe in hard selling and as a result we have built a solid reputation where our customers renew with us year after year. We look at each business submission and determine if it meets the broad requirements of being a good business (guidelines to be published soon). If we get serveral complaints about a business that are substantiated we will suspend or delete a business from the directory. We are looking for people to volunteer to help run the free section of this site. If you think you can offer a few hours a week to help us please give Paul a call on 07941840862 for a chat.